Wat Tan Hor (Cantonese Fried Noodles with Silky Egg Sauce) a.k.a. "kong foo chow" is a must-try! Can be easily prepared at home. 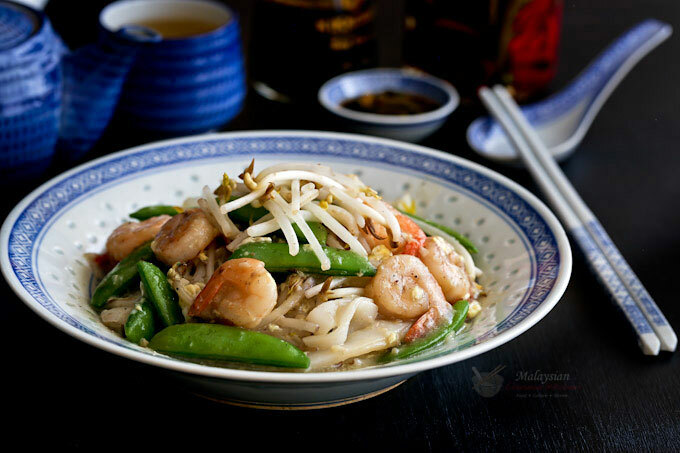 Remove koay teow (flat cut rice noodles) from packaging and place on a microwave safe dish. Microwave on high for 5 minutes. Remove from microwave and loosened up noodles. Set aside. Heat 2 tablespoons vegetable oil in a wok or large fry pan. Fry noodles until slightly crisp, about 4 to 5 minutes. Remove and divide noodles onto 4 plates. Set aside. Add 1 tablespoon vegetable oil to the same wok or large fry pan. Stir fry sugar snap peas for 2 minutes. Remove and set aside. Then, add bean sprouts. Stir fry for 20 seconds. Remove and divide beans sprouts over each of the 4 plates of fried noodles. Add remaining 2 tablespoons of vegetable oil to the wok or large fry pan. Sauté garlic for about 30 seconds. Add shrimps and ground pepper. Stir fry for 2 to 3 minutes. Add chicken stock and bring to a boil. Season with salt. Add corn starch mixture. When stock comes back up to a boil, return sugar snap peas to the wok. Then stir in the beaten egg and immediately turn off stove. Serve with pickled green chilies or cut red chilies in soy sauce.